Dr McGrath, after I demonstrated that he once again claimed a mythicist wrote the opposite of what he really did write, has quaintly responded with a post titled Why Do Mythicists Care So Little About Facts and Details? in which he writes a revisionist account of his original post. [Neil Godfrey] repeats Richard Carrier’s claim that mythicism is embraced by individuals like Thomas Thompson (who has distanced himself from mythicism) and Kurt Noll (whose contribution to Is This Not the Carpenter? is rather wonderful and does much to undermine mythicism). Combine this with Brodie’s defection to mythicism, alongside Thompson’s, and (like Thompson’s) the publicly professed “historicity agnosticism” of Arthur Droge, professor of early Christianity at UCSD, and Kurt Noll, associate professor of religion at Brandon University, and Ehrman’s argument that only amateurs and outsiders take the Jesus Myth theory seriously is now in the dust. There is still, certainly, a litany of crank and amateur mythicist nonsense. But there is also a serious case to be made, by serious and well-qualified scholars. And they need to be paid attention to, not dismissed and mistreated, their arguments straw manned or ignored. So McGrath is once again careless with the facts and details. That is not a claim that Thompson and Noll “embrace mythicism”. They do not. Carrier clearly states Droge and Noll are “historicity agnostics”! The point is just as damaging to McGrath’s case, however. They are not viscerally hostile towards the Christ Myth possibility as is McGrath. They acknowledge its plausibility. McGrath can never accept even that much. Never. I wrote my monograph of 2005 in an effort to explore the continuity of a limited number of themes which were rooted in ancient Near Eastern royal ideology—an issue which is not only marginally related to questions of historicity, but one which also has much to say about the perception of history and historical method among modern scholars. . . . It is a small book, and its ambitions are few: hardly more than to point out that our warrant for assuming the existence of a historical Jesus has important limits. Yes, his argument has the potential to open up the question of mythicism. But Thompson himself is not addressing mythicism per se. I know his argument reasonably well, I hope, because I believe my own arguments are very strongly influenced by Thompson’s. That’s why I have generally avoided the label “mythicist” for myself. McGrath’s hyper-sensitivity in this area does not seem to benefit him with any capability of understanding such subtleties. In my initial response to James McGrath’s review of Thomas L. Brodie’s Memoir, I zeroed in on a single remark by McGrath that grotesquely misrepresented what Brodie himself explicitly wrote. I explained why I was not writing a comprehensive response at that time and why I chose to single out that one point for attention. But although his idea was concocted prior to his learning how to do scholarship . . . I recommend that this book be widely read. It illustrates the bankruptcy of Jesus mythicism, and the fact that it has the potential to ruin careers, not because there is ingrained antipathy to it in the academy, but because the case for it is based on thoroughly unpersuasive arguments, and the complete disregard for other possibilities, . . . 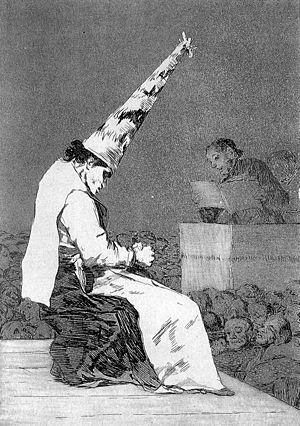 The book can serve as a warning to young scholars to be open to criticism and feedback (and to more established scholars to provide honest and clear feedback, since I found myself wondering whether anyone actually told Brodie that he was using dubious methods and criteria to produce dubious results). Updated about 20 minutes after original post -- detail added to the "So why I did not find. . ." paragraph. The only detail so far unexplained in the deactivation of the Vridar.wordpress blog is why I apparently did not receive a warning notice from WordPress itself. 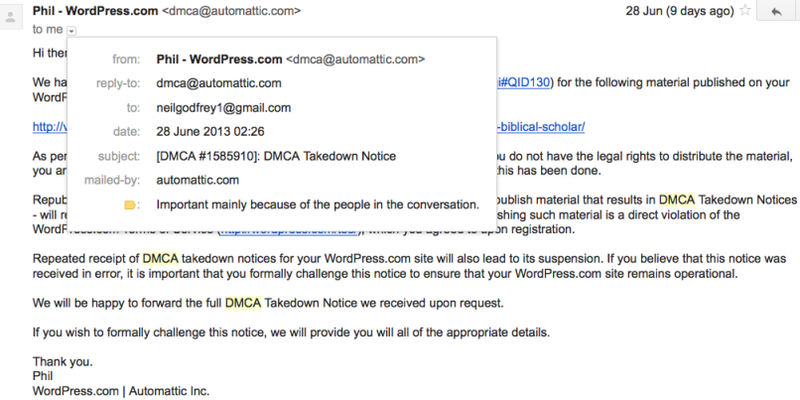 2:26 AM, Tuesday June 28th, WordPress/Automattic email me notice of their takedown of my post about Joel’s nonsense. But being 2:26 AM I am, as usual for that time, asleep. Around 3 AM I wake up (as I do from time to time) and check my iphone for current news and recent blog activity. If I looked at my Gmail at that time (I don’t recall if I did, but if I did then I would have ignored anything that did not look interesting — I would have ignored anything from “WordPress” since it’s usually some notice of a new product, new theme, — I’m not interested) the subject header would have meant nothing to me (what’s “DMCA”?, looks technical, some outage time?) and I would have ignored it. The only thing I know for certain is that I did not take any notice of my email at that hour. But I did see something odd: my post on Joel’s history/science nonsense is in ‘private’ status. Maybe Tim is doing something with it. I decide to check with him later and go back to sleep. Once awake I check the post in “private” status, see nothing wrong with it, so restore it to “public” status.